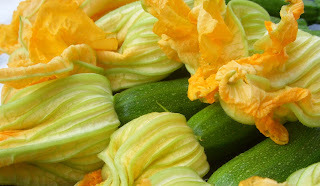 If you are wandering though your local farmer's market, be on the look out for zucchini or squash blossoms. Two summers ago when we were in Spoleto, Italy, I had these terrific squash blossoms that were cooked fritto misto style - aka lightly battered and deep fried or sauteed in olive oil. Delicious? Si! Healthy? Non! When I returned home, probably a good ten pounds heavier from all the gelati and fritto misto, I started Weight Watchers and stopped seeking out all things battered, covered and smothered. Last summer, I came across squash blossoms at the Head House Farmer's Market down off of 2nd and South Streets, and have since fell in love with them all over again. While I mostly support the local seasonal farmer's markets, I've also been disapointed with them too. Don't get me started on the local Philadelphia farmer's market - some vendors at the South Street Market are so over-priced, over-blown and crowded, with g#d forgive me - idiotic families with SUV-Style Strollers and over-grown dogs clogging the aisles of the very narrow passage way of the Head House Shambles. Gawkers, talkers and posers all standing about and turning what ought to be a delightful Sunday Market into a shopper's headache. But I digress. There are a few stands at the farmer's market that seem to have fair prices (but $5 for organic eggs? WTF? ARE YOU PEOPLE FOR REAL? Why not take my friggin' wallet, empty it out and return it to me after you're done robbing and pillaging me). Um, yeah, I'm having a few issues with the local markets these days. But I love my Lancaster County CSA organic produce share, so it's all good. Anyway - back to the topic at hand. I bought some zucchini that still had the blossoms attached. I lightly sauteed them in a non-stick pan with a small amount of olive oil, a bit of garlic and a pinch of salt and pepper. Molto Delicious0! You don't need to batter them, stuff them with cheese or deep fry them. Keep the cooking method as simple as you can, use extra virgin olive oil, a non-stick pan over medium heat and season with salt and pepper, maybe a sprinkle of Italian seasonings and you're set. 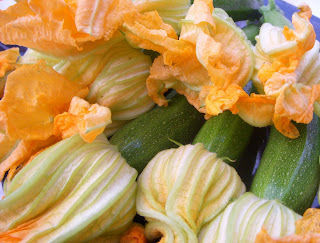 The squash and blossoms are very tender - they don't need a lot of heat or cooking time. The blossoms have a light floral taste - a bit sweet, a little earthy and very subtle. 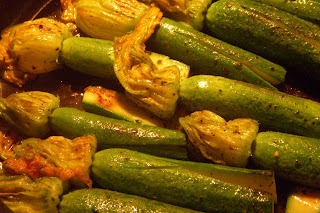 Wash the zucchini and squash and blossoms gently in cold water and pat dry. If the squash is thicker than an inch around, slice them up the center, splitting the squash in two halves, but stopping just before you reach the end. Since the squash I bought still had the blossom attached, I kept it intact. Heat 1 tablespoon of extra virgin olive oil in a non-stick saute pan over medium-high heat until the oil begins to shimmer. Work in batches and gently add to the pan the squash and brown on one side about 2-3 minutes. Carefully turn the squash and brown on all sides another 2-3 minutes. Continue cooking the next batch of squash and blossoms in this manner, adding more olive oil as needed. Before removing the squash and blossoms from the pan, season with the dried Italian seasonings, salt and freshly ground pepper. Serve hot immediately.